Bloghorn spotted this great work during this week ending the 27th February 2009. Bloghorn is delighted to report that one of our patrons is making a debut performance in a tricky art form this weekend. Times columnist and BBC Radio Four presenter Libby Purves is taking on the art of stand-up comedy on behalf of Comic Relief. Bloghorn finished our interview with Artist of the Month, Neil Dishington ‘Dish’, by asking about his thoughts on the future of making jokes in drawing. I hope there is one. I used to advise the kids I taught to ‘go for it’ otherwise you will regret not giving it a go. I still meet up with some of them, they are in their 40s: Designers and Illustrators etc. It is a joy to see how successful they are…. they took that advice (one of the rare perks of teaching). And what of the future in the digital age? Of course there is one, but I do find a lot of enhanced stuff in films rather bland and predictable, effects for effects sake. I even thought the latest Wallace and Gromit rather ordinary… oh dear that will annoy some people. Bloghorn will be unveiling a new Artist of the Month for March next Friday. New Cartoon Museum set to open. Angoulême, in the Poitou-Charentes region of western France and home to the recent International Comics Festival (as reported here) is to get a 1,300 sq m museum dedicated to the history and practice of creating cartoons and comics. The museum is planned to open in June, when entrance fees will be €4 (£3.50) for adults to the main museum and €3 (£2.60) for the additional temporary exhibitions. Combined entrance will be €6 (£5.30) per adult. South Korea to celebrate 100 years of cartoons. Since the publication of the first Korean cartoon (a political cartoon on Japanese efforts to annexe the peninsula) on 2 June 1909 cartoons and comics have blossomed into a industry thought to be worth around US$600 million (over £400 million). The Korean government is also setting aside $96 million (over £60 million) over the next five years to support the industry. Cartoons used as a ‘medium of social crusade’ in Nigeria. The Spanish Embassy in Abuja, Nigeria is hosting a programme to reinforce and promote the culture of cartooning through a series of workshops, exhibitions and awards, with the aim of encouraging sharing and co-operation between their two cultures. Rupert Murdoch, Chairman of the New York Post, the newspaper which published a recent controversial cartoon by Sean Delonas has apologised for the offence it has caused. The events for the 2009 Shrewsbury International Cartoon Festival have been announced. This year’s theme of Science coincides with the 200th anniversary celebrations of Charles Darwin‘s birth in the town. This year’s creative art and science activities run across Friday 24th and Saturday 25th of April, 2009. Friday 24th and Saturday 25th April, 11am – 4pm, in the Town Square. Cartoonists work on giant 8ft x 6ft drawing boards to create art on this year’s festival theme of Science. Who Do You Think You Are? The opportunity to acquire a brand new body in a non-violent version of the village stocks. In “reverse caricaturing” the artist draws the subject’s body life-size on a giant canvas below their head. Order the body you aspire to, or put yourself at the mercy of the artist! Bring your cameras. Saturday 25th April, 11am – 4pm in the Town Square Free cartoon caricatures made in the Town Square. Friday 24th and Saturday 25th April, 11am – 4pm – Darwin Shopping Centre, lower level. Humurals are instant-on-the -spot drawings by the festival cartoonists which build a wall of cartoons. Sunday 26th April at 10am – 11.30am – Shrewsbury Museum and Art Gallery. Meet the Cartoonists: a relaxed morning and chance to meet the Festival cartoonists informally and enjoy the exhibition in the Gallery. Thursday 23rd April at 7.30pm , at The Prince Rupert Hotel, On the Origin of Spaces: A loose history of architectural space with cartoons. Apart from keeping the rain out, architecture has been defined as the enclosure of space. How architects have managed to achieve this feat over the years is the subject of this non-serious cartoon-illustrated talk by ex-architect and now-cartoonist, Roger Penwill. Sponsored by Shrewsbury Civic Society. Tickets £5. Please book in advance on tel: 01743 356511 or at Bear Steps Gallery. Bill Stott – The Illustrated Science and Philosophy of Serious Ranting. Stand-up with cartoons. Not suitable for children, pets or anyone who doesn’t agree with Bill. All tickets £5. Please book in advance 01743 281281 or at The OMH Box Office. Steve Bell – Illustrated talk by UK Political Cartoonist, creator of the “If” strip in The Guardian. Almost certainly not suitable for children. All tickets £5. Please book in advance 01743 281281 or at Box Office. Thursday 23rd April 4.30pm- 6pm Drop-in cartoon workshop for all ages, at Bear Steps Gallery, with Angela Martin. Come after school or work to get into a Cartoon Festival mood by creating cartoons and caricatures with all sorts of materials. Friday 24th April 5.30pm – 7pm Infinity and Beyond, Wyle Cop – Workshop for children aged 8 + and adults with Hunt Emerson. Saturday 25th April 10.30am – 12.30pm Family cartooning drop-in workshop, at Shropshire Wildlife Trust, with Chichi Parish. 11am – 1pm Infinity and Beyond, Wyle Cop. Comic art workshop for older children and adults with Hunt Emerson. 2pm- 4pm Create a Comic Strip, at The Cornhouse, Wyle Cop. Fun writing and drawing just like the professionals – drop in workshop with Tim Harries. For children 8 – 12 and families. Free. No need to book. Children must be accompanied. 2pm – 4pm Drop-in workshop for all ages, at Shropshire Wildlife Trust. 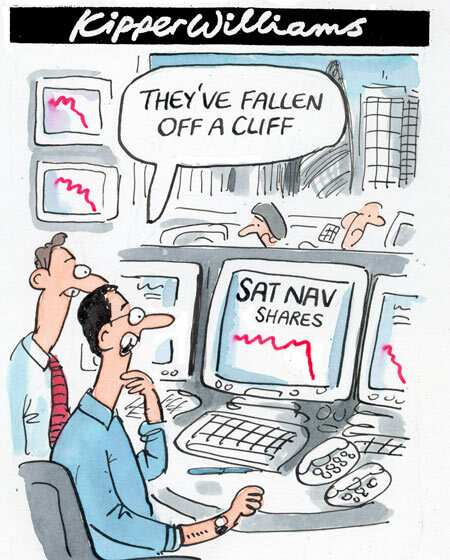 Creating cartoons is fun for everyone – come and have a go. Inspiration and guidance from cartoonist Angela Martin. Cartoon Clinic 10.30am – 12.30pm and 2pm – 4pm Both sessions at Bear Steps Gallery. Budding cartoonists of all ages are invited to bring their work for a professional critique and some tips from successful cartoonists. 3pm – 4pm Getting Published, at Cath Tate Cards, Hills Lane. Meet Cath Tate of Cath Tate Cards, publisher of greetings cards and postcards. Come and get some advice about getting your work published. Science Friction, 23rd April – 31st May, Shrewsbury Museum and Gallery. 200 years of poking fun at science and scientists. Cartoons from the British Cartoon Archive, British Museum and Cartoon Museum alongside 21st century work, selected by Professor Colin Pillinger Open Daily 10am – 5pm (4pm Sundays). Boffination, 13th April – 11th May , at Bear Steps Gallery, Open daily 10am – 4pm – Festival cartoonists treat the great themes of 2009 – science, nature and the 200th anniversary of Charles Darwin. Selling exhibition of originals and prints including lots of new work by artists from the UK and beyond. Steve Bell, 13th April – 11th May also at Bear Steps Gallery. Miroslav Bartak – 13th April – 6th June, Theatre Severn, Chapel Bar. Life, the Universe and (Almost) Everything 23rd April to 31st May at Cath Tate Cards, Hills Lane – Cartoons from the New Scientist by Kate Charlesworth. Open Mon – Sat 10am – 5pm and Sunday 26th April 10am – 4pm. The official Festival site is here. Bloghorn says see you there. Bloghorn spotted this great work during this week ending the 20th February 2009. 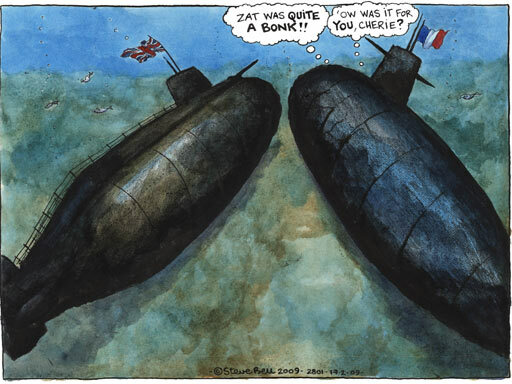 Three: and Steve Bell in the Guardian on that underwater bonk. I was influenced by David McKee and Mike Williams…his recent exhibition at the Cartoon Museum (and the Shrewsbury International Cartoon Festival) was a real gem. Larry (the late Terence Parkes) of course and a few artists for the New Yorker. Sam Gross is a particular favourite. I also believe my work has been much influenced by films…especially the early Woody Allen films and the Marx Bros. I just love the one-liners. BBC Radio Four’s Today website has a series of pictures on A Peep into Clubland, the new exhibition at the Cartoon Museum. There’s more on the show here. The issue of offence in drawn communication has reared up again in the United States where a cartoon by Sean Delonas featuring a dead chimpanzee has been used to comment on the passing into law of President’s Obama’s national economic recovery package. The drawing is causing a degree of outrage because of its real, or imagined, racial undertones. Bloghorn thinks offence or amusement tends to be in the eye of the beholder for every drawing. Freedom of speech and image production is worth defending, but with this comes a responsibility not to gratuitously offend. Racial stereotypes are a particularly difficult area and can easily appeal to the the ignorant, prejudiced and intolerant.